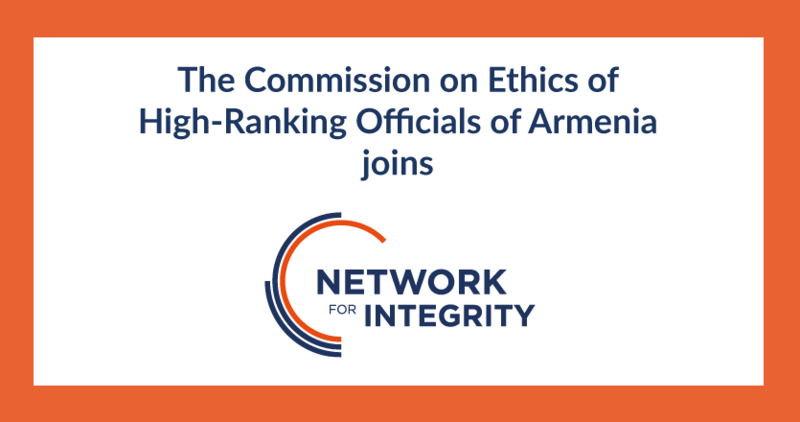 The Commission on Ethics of High-Ranking Officials of the Republic of Armenia joined the Network for Integrity in November 2017. Its membership was unanimously approved by the 13 founding members of the Network, after the review of its application. Indeed, the Network Charter describes the conditions to be fulfilled by institutions that wish to become members: they must perform missions, fixed by law, relating to integrity, transparency and ethics in public life; exercise its competencies in full independence and have a non-judicial status. Based on the documents transmitted by the institution as part of its membership application, the Commission of Armenia seems to meet these criteria. Created by the 2011 Law on Public Service, the Commission is entrusted with missions relating to the collection, control and online publication of asset and income declarations, the detection of conflicts of interest and violations of ethical rules, and the issuance of recommendations for their prevention to the Presidency of the Republic, the Assembly and the Government. Moreover, the Commission conducts training courses for public officials and public awareness campaigns on conflicts of interest and ethical rules. The institution is committed to the Open Government Partnership in order to promote a more open and transparent administration for citizens. Besides, the Commission is an independent institution, from an administrative and budgetary point of view. Members of the Network for Integrity are pleased to welcome a new partner in promoting ethics, transparency and integrity in the public sector. The Commission will be fully integrated into the activities of the Network, based on the sharing of experiences, technical cooperation and concrete exchanges between counterparts. A few days before its first anniversary, the Network is now composed of 14 members.